Raymond Corcoran Trucking, Inc. (RCT) is based in Billings, Montana and has been in business since 1971. The company was founded by Raymond and Charlotte Corcoran and was incorporated in 1981. 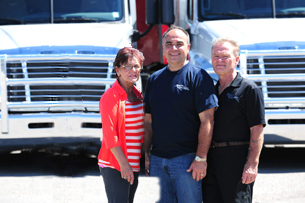 Their son, Brian, joined the team in 1985 and began managing the business. In 2001, after 30 years in the industry, Raymond and Charlotte retired and sold the business to their son, Brian Corcoran. With years of experience already managing the business, Brian transitioned easily into his new role as President and Owner. Together with our sister company, (R B & C Grain, Inc.), we strive to be the best and safest carrier for all of our valued business partners! Brian also owns and operates RB&C Grain, Inc. which he founded in 1985 as a sister company to RCT, Inc. In the beginning, RB&C Grain's sole purpose was to market RCT trucks back to California, Utah, Oregon, and Washington from Alberta, Saskatchewan, Manitoba, Montana, and North Dakota. As the agriculture industry advanced in the early 1990s, policies and regulations made marketing bulk van trailers impossible, which caused RB&C Grain and RCT to find new ways to blend their partnership. RCT has reefer trailers and hauls a variety of products including dry, perishable, refrigerated, and frozen products primarily in the western and central states and Canada while RB&C has bulk agricultural trailers and hauls product mostly within the Rocky Mountain Region and Canada.